The New Colossus is a local nonprofit focused on the education, awareness and prevention of human trafficking in Sioux Falls, South Dakota, and the Midwest. We offer trainings to businesses as well as talks to schools that educate community members about what human trafficking looks like in our region. Our goal is to act as a bridge builder for all community members and law enforcement who have the opportunity to play a direct role in victim identification and prevention. 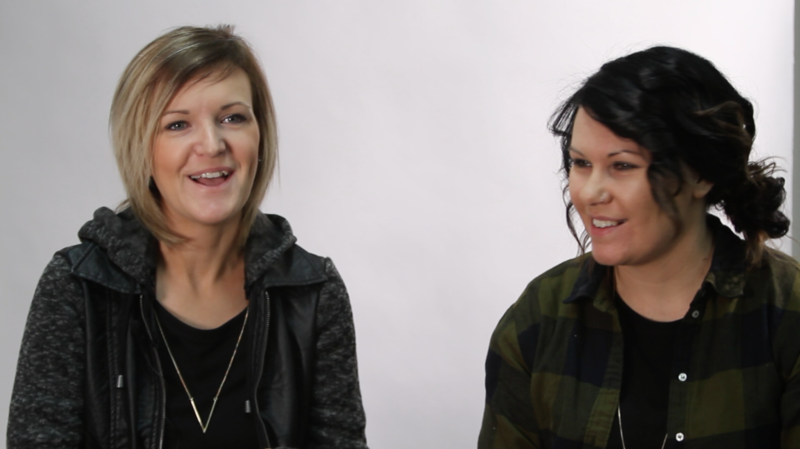 We are Ashley Statema and Polly Dean, and we are the co-founders of The New Colossus. We first met when Ashley was working for Be Free, the first local organization to address human trafficking. Be Free was screening a documentary at a local church, and Polly was in the audience. The documentary was enough for Polly to want to invest, so she and Ashley began working together. After the founder of Be Free retired, we formed The New Colossus to continue the education and prevention piece of human trafficking in South Dakota. Polly traveled to Bangkok, Thailand, as well as Cambodia to learn more about human trafficking, just like Ashley had years ago. We both began our education in human trafficking overseas, but we quickly realized that the problem was just as big — if not bigger — here in the United States, so we knew our focus needed to be here, in our home state. And we haven’t stopped since. The New Colossus began in 2012, and our main goal is to reach people before they become a victim. Although we do care for and help to rehabilitate victims, our primary focus is in trying to avoid a victim getting to the point of needing medical care, housing or mental health care in the first place. We want to stop it before it gets to that point, and that begins in prevention. When we go into schools, we host all-school assemblies that educate teens on internet safety, what human trafficking looks like, and help them to feel equipped and confident to protect themselves. We know that parents, teachers and coaches are telling students to be careful on the internet, and that’s important, but we come forward to tell them why. We want to give them the information they need to keep themselves and their friends safe. We tell students that traffickers don’t look like that strange guy in the corner. Traffickers are people who seem extremely fun, exciting and cool. They are the older friend who buys alcohol for you and takes you shopping, makes you feel really cool. They are charismatic, fun and smart, and they know how to read people well. Their manipulation tactics are phenomenal, and they know exactly what to say to a vulnerable teenager. We tell students that trafficking is not like abduction. Here in South Dakota, it’s a lot more like emotional abuse, manipulation, and what we refer to as “the chain around the brain” versus physical cages or holding someone hostage. Traffickers first become a boyfriend figure or will morph into anything the victim needs. But once a relationship is built, traffickers gain control of everything in a victim’s life and force them into prostitution because they convince the victim that they owe the trafficker everything. More conversations like this and raising awareness is our biggest tool right now, and we can never stop having these discussions. We want to empower the younger generations and give them permission to speak up when necessary. They need to understand that their voice matters. In our training sessions with local businesses, we tell people everything we know about human trafficking and then talk about steps they can take to prevent victimization. In human trafficking, safe houses, medical care, counseling and more is all needed very much, but for us to fund our work appropriately, we have to first talk about human trafficking. We have to sit with students and school counselors, caseworkers and domestic violence shelters, nurses and doctors as well as law enforcement to explain what to look for and how to bring it up in conversation. We’ve also talked to property managers because traffickers rent multiple apartments to use, and we’ve hosted training sessions in hospitality because we want hotels to know what to look for when a trafficker attempts to take victims to a hotel. No matter what work a community member is involved in — whether they are a student, teacher, politician, first responder or nurse — they should know how to use their platform to prevent human trafficking. You can prevent human trafficking, too. As endless as our work is in prevention and education, we need our community to invest in prevention along with us. Instead of putting out fires that have already started, we are asking our community to help us prevent fires from starting. Invest in the knowledge not only financially, but by booking trainings, talking about it more and learning how to talk to your kids about it. We must do this work together. It’s natural for all of us to become passionate after a disaster happens, but we need to be passionate before the disaster happens, because that’s where the real change comes. We recently began a new campaign called Zero is Possible, meaning it is possible to completely get rid of human trafficking and have zero victims, it’s just a matter of getting to it before it happens. Zero is possible by way of prevention, and we believe in our community to help us get there. A couple years ago, a local high school teacher was teaching her students about historical slavery versus modern day slavery and asked if we would come in to talk about human trafficking and slavery in our area today. We did, but we had a lot of defiant students in the audience. So much so, that we felt defeated, saying to ourselves, “I don’t know if I can do this anymore.” But shortly after that, we received a Facebook message from one of the girls in class that day. She sent us screenshots from a conversation she was having with a boyfriend via an app. She had never met him before, but she thought she at least knew his age and what he looked like. The screenshots were of sexting, pictures and things she wasn’t proud to share with us, but after we came to her class, she said she started wondering if those conversations were what we were talking about, and she was right. She was 15 years old, and he was offering her a job of $1,500/week plus tips, he offered to transport her to wherever he was, and it was textbook perfect for a grooming case. It only took 30 minutes for even the most defiant teen in the room to realize this was happening to her and that she needed to do something about it. It was a turning point for us, and we knew we had to keep doing this, over and over again, because she proved to us that this works. We found out years later that she stayed and graduated from high school two years later. It actually works, and we must keep going.